Lindy's Cheesecake - This is a traditional New York City Cheesecake. 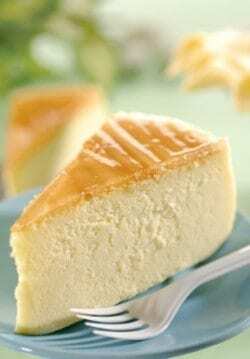 Home » Copycat Restaurant Recipes » Lindy’s Cheesecake – This is a traditional New York City Cheesecake. Lindy’s Cheesecake – This is a traditional New York City Cheesecake. This recipe for Lindy’s Cheesecake was spotted by a view in a New York Times in 1978. This is a most delicious cheesecake, it does take a little work, but with this recipe, you will have a cheesecake everyone will rave about. This is a traditional New York City Cheesecake. Generously butter an 8 inch round springform pan. Sprinkle inside with crumbs. Grate lemons and orange; set gratings aside. Add room temperature cream cheese to the bowl of a mixer. You will want about a teaspoon of each of the lemon and orange zest. Add rind and vanilla, and continue beating. Gradually add heavy cream and sugar. Beat constantly at moderate speed. (Avoid high speed). Add eggs one at a time, beating well after each. Beat in sour cream and half and half cream. Pour mixture into pan. Smooth surface. Set pan in a larger one. Pour boiling water around it. (Best to do on oven rack) Place in oven and bake 1 1/4 hours until center does not quiver when shaken. Remove from water bath and cool 10 minutes. Un-mold while still hot. Let stand until cool. Please note if your springform pan is not watertight DO NOT use a springform pan. If your pan is not water tight use a regular cake pan. I have been baking and selling cheeses cakes for many years. Every one I bake I think it is the best. There are so many recipes. If you are a good baker all your cheesecakes can be fantastic. Ok… I have been making this cheesecake every year since 1989. I got the recipe from some NY Times article when I went to college in DE. First, the CHEESECAKE is the best, not the crust. Secondly, I have made w/Philadelphia cr am cheese and store brand. While all good, Philadelphia ROCKS it over the edge. I have a butter cookie crust w/lemon zest only, 1 T. Simple. The cheesecake has BOTH lemon and orange zest- 1 T. if each. I have NEVER put vanilla in and I love vanilla. Did it once, wasnt the same. I do the oven at 475 in beginning. Written that way. DO NOT overmix and it will be beautiful. Takes 2 days for perfection… mix it (all ingredients room temp), bake base 10-12 min, then assemble springform and press the rest of dough up sides, put in pan and bake at 475 for 15 min.- turn down to 200 and bake 1 hour, turn off oven and leave for 15 min., cool on rack for 1 hour and refrigerate for 12 hours. These steps make it perfect. I’ve messed w/recipe a bit over the years, but to get true Heaven, it has to be done the original way, or at least the way it was printed in the paper MANY years ago. Though, I DO read LOTS of cookbooks (including NY times ones) and have NEVER seen this exact recipe. EVER. ANYWHERE. I mean, there is NOT a lot of BAD cheesecakes, so if you want graham crust, do it. If you want cookie, do it. NEVER found a “ sponge” crust, ever…. if you like it, do it. As I said, it’s yhe CHEESECSKE that is to die for, not the crust ????. Lindy’s and or New York cheesecake does not have Cookie, Gram Crackers , or sponge in it. . .
Why don’t we go to the source – the New York Times Cookbook which I looked up today. The recipe was first published on 5-18-1977 by Craig Claiborne, the long-time NYT food editor. It used graham cracker crumbs sprinkled over a well buttered springform pan, with the excess being tossed. Ingredients and techinque change and 38 years is a long time. If it works for you then you have the correct version. this can’t be the reall Lindy’s cheesecake recipe! The 1 thing that is specific of this cheesecake is that it’s got a sponge base, not a cookie crumb! I am eating some right now, it’s the best thing ever! Wow, I am confused now 😉 Sandra says it is a sponge base, and Judy says it is a butter cookie recipe. This was the recipe that was posted in the New York Times, maybe they changed or adapted their recipe over the last 30 years? hi, it’s me again! didn’t mean to confuse anyone but i’m absolutely positive! spent the w/e in NYC, googled best cheesecake in Manhattan, Lindy’s came up so I went and got a slice. Very pricy but the best NY cheesecake I’ve ever had. I bought a city guide talking about it and actually saying that the sponge base was its specificity! I have to say it makes a big difference, it’s a lot more subtle texturewise and flavourwise than a normal cookie base. I then tried the 2 little hens one the next day, which is very nice indeed but not as nice, mainly due to the crust. The problem is I’ve looked everywhere on the internet for the recipe, it definitely a cookie crust, which is very strange. i’ll keep looking, I live in London and need to be able to make it back home! I am sure this cheesecake is very delicious, but it is not a copycat of Lindy’s. Lindy’s was known for it’s butter cookie crust and never used a graham cracker crust. The cheesecake doesn’t rise at all. It is baked initially at 500F, then at 250, producing the characteristic dark brown top. It doesn’t crack and it doesn’t rise. It’s super creamy, firm and crazy delicious. I have the recipe on my website, Judy’s Kitchen. There are no measurements for the orange and lemon gratings. What if your lemons are smaller or your orange is bigger? How many cups or tablespoons of this is added? I would use about a teaspoon of each. This was a great recipe, but I wish it’d have warned me that it would rise so much! I used a 10 inch cake pan because I did not have a spring form pan. I filled it almost to the top, with about a 1/2 inch to go. This cheesecake rose up to 4 inches above the edge after 40 minutes. It almost spilled over the sides. I had some left over batter and made a smaller cheesecake that turned out WAY better. I can understand you may have had a frustrating experience. The spring form pan is really necessary, it was included in the instructions. Spring form pans are very deep 4 to 5 inches and the cakes often rise all of the way up to the top. It is a tasty cheesecake though.